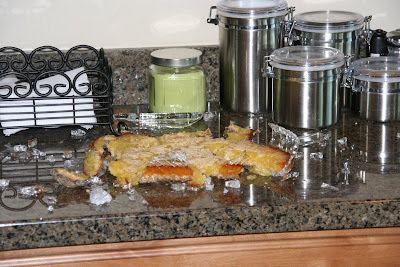 Don't you just hate it when you are so in the mood for lemon bars and you go to all the trouble to make them and when they are finally done you take them out of the oven and set them on the counter top, and the whole pan just explodes all over your kitchen? I hate that!!! That is exactly what happened to me last night and it scared the living crap out of me. Jason has been out of town for the last several days, so I was a little on edge anyway, but then to just be in my kitchen, minding my own business, and suddenly it sounds like a shotgun is going off 3 feet away and glass is flying everywhere... kind of freaked me out. I am just glad my back was turned and the kids weren't in there, because there were shards of glass all over the whole kitchen. It was a heavy-duty Pyrex pan, too, and the counter top wasn't even cold. It was 74 degrees in the house, so it is all too weird for me to figure out right now. I guess it just wasn't meant to be that I ate a whole pan of lemon bars by myself for our FHE treat. "Sorry kids, I know you hate these, I'll just eat yours too." Such a thoughtful mother. Oh my gosh. That is so crazy. I'm glad no one got shards of glass shot at them. I think I'll keep this incident in my "reasons I don't cook much anymore" file. Wow! That is weird. I have to say that I have never had a pan explode on me before. ( I hope I never do.) I am glad that you are all okay! I'm so sorry for you...They looked good, too!! What a strange thing to happen.... I had a pan crack once, but not explode!! That would have freaked me out, especially being home alone. wow that is scary! that has never happened to me. It is good to know that you are all okay. That is so crazy! I'm glad everyone is okay though! I've actually heard of that happening before, but it still seems so weird!